If you often perform roofing or framing tasks in your line of work, I bet you cannot imagine doing anything without a nail gun. No matter how fast you are at hammering nails, a nail gun is always going to be faster, more precise and easier to use. There are several types of nail gun based on what kind of nails they use, the application, power source, and so on. When it comes to features, some are only available on top of the line models while some are present on every model out there. Seeing as every nail gun is designed for a certain type of job, you should choose one that matches the requirements of your project. In order to do that, you have to know all the stuff I have mentioned in the paragraph above. In the paragraphs below, I am going to tell you about their features and what you should be mindful of when choosing one. Nail guns differ depending on what type of nails they use although there are some slight overlaps. There are a total of 6 different nail gun types: Framing, roofing, flooring, concrete, and finish nail guns as well as those which are used for some of the finer work like brad nailing, tacking, or stapling. Framing nail guns are designed for serious heavy-duty work because they can fire 2.8mm nails into any type of wood. For the most part they are used in cases when they have to withstand a large burden such as wooden beams, or heavy wooden constructions. Roofing nail guns (as the name suggests) are used for firing roofing nails. One of their defining characteristics is they’re very light and easy to use which is understandable since you’re working on a roof! They are also able to hold more nails because they have coiled instead of straight magazines. Finish nail guns generally use high-gauge nails which have their place in carpentry and furniture making. Not all of them are the same since they can differ based on the shape of the nail head they accept and the size of the nails. One of the most popular types is the 16-gauge nail gun. 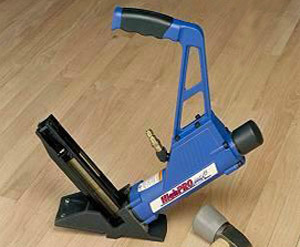 Flooring nail guns have a specific shape which allows them to stand on the floor and fire nails at a right angle. The two basic types of flooring nail guns are cleat which are more useful when it comes to denser types of wood, and flooring staple guns. Brad nail guns are used for the finest kind of woodworking tasks. They are suitable for trim work, and use high-gauge nails. The most common types are the 18-gauge and 23-gauge which are used for beading and interestingly enough, constructing doll houses. For cases when brads alone can’t do the job, staple guns are very helpful. For instance, you can use these when upholstering furniture. Concrete nail guns are obviously the most powerful type since they shoot nails directly into concrete. You don’t come across these very often because they’re for industrial use. For all other purposes, framing nail guns will do just fine. Based on the kind of power source nail guns use, there are three distinct types: Pneumatic, cordless, and electric. Of course, pneumatic nail guns rely on power from compressed air to shoot nails into the material. 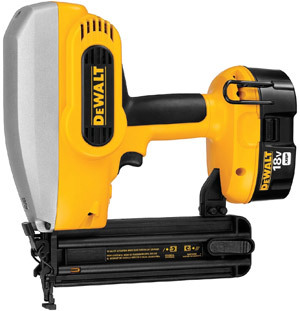 Cordless nail guns are powered by batteries, and electric nail guns rely on an electric current from the mains. Each type has its own unique characteristics as well as their pros and cons. More on that next! 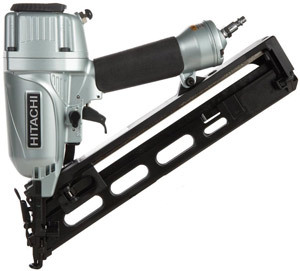 In order to work, pneumatic nail guns need to be connected to an air compressor. They are by far the most powerful and reliable type although, there are some disadvantages to using them such as the limited range of movement since your nail gun is connected to the compressor. 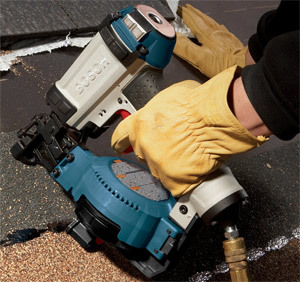 Cordless nail guns use gas which is ignited by a spark provided by the battery. 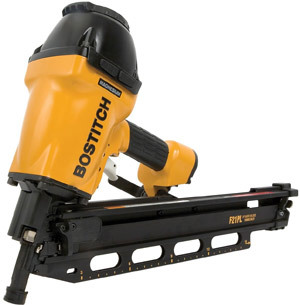 This type of nail gun allows for more mobility than the pneumatic type. However, you do have to keep in mind that the battery needs to be charged (and often in some cases). You can get a back-up battery and charger that is able to recharge it within 60 minutes, but there is still the issue of fuel which you have to buy once the fuel tank empties. Electric nail guns are only powerful enough to be used for smaller-scale work, and they can be hooked up to a standard electrical outlet. They are corded which means portability is limited. On the plus side, you don’t need a compressor, to recharge batteries or buy fuel canisters. There are two types of magazines available for nail guns: Straight and coil. While the straight ones are much lighter, the coil ones hold more nails which makes them ideal for extensive work. When choosing a magazine, make sure the angle is the same as the nail gun. It’s important you bear in mind what type of magazine you’ll need for the model of nail gun you would like. On most nail guns, the nails are fired when both trigger areas are activated. One area is usually the very tip of the gun, and the other is the trigger which you need to press with your index finger. Based on the sequence in which these triggers are activated, there are two types: Contact and sequential. Contact triggers fire the nail as soon as the tip comes into contact with the wood. All you have to do is hold down the index finger. This can be dangerous because you can accidentally shoot a nail in a direction you don’t want to which could end up in a very painful (and messy) accident! Sequential nail guns are much safer in that aspect since the sequence is reversed. You need to depress the tip against the material then press the index finger trigger in order to fire the nail. The downside however, is that nails will be fired for as long as you hold down the index finger which means you have to be very skilled in operating this type of gun. You can change the settings so the gun fires only one nail at a time, but that option requires more work on the operator’s part. Certain nail gun models allow you to set the force at which the nail is fired which effectively means greater depth. For some nail guns, you will need a separate tool in order to manipulate the nail depth. Others will let you change the depth which makes for better flexibility. At some point, your nail gun will jam no matter how good it is. You should always aim to get a model which has a jam clearing mechanism that is easy to disassemble and put together. This feature prevents the nail gun from firing when you run out of nails. When buying a nail gun you have to look at several different factors which include: Driving power, nail angle, nail head compatibility, nail length and diameter, magazine type and its capacity, weight, accessories and so on. It’s also a good idea to get a bag or case for the gun to prevent dirt and debris from getting into the mechanism. Nail guns are an essential tool for most professionals and enthusiasts who want to get the job done in an efficient manner. Hopefully the information above is enough to set you on the road to finding the right nail gun for you. Of course, you can check out my best picks if you are ready to take the next step.